Big questions for Dutton coming out of tonight's 4 Corners. He has refused to comment on allegations that Border Force Officials are thwarting Saudi women's bid to claim asylum. Shameful, but what do we expect from him? He's only for French au pairs seeking asylum. Far more dangerous being returned to France. Here is an article that refers to the 4 Corners accusations I referred to. Mr Dutton later conceded Mr Shorten may not have actually been briefed. What was that Morrispn said about be the PM for Standards? ^ I don't know if I generally agree with the conclusions of the first article. For one, it is indeed highly irregular for a Saudi woman to be travelling alone. It is the responsibility of border patrol people to examine irregularities. Often questions like this can uncover things that require further investigation, or even support. Simply asking the question is not a demonstration of Saudi collusion, or even a thwart (necessarily) on asylum seeking. However, that said, Australia does have a track record (recently) of not being receptive of asylum seekers, particular those coming from predominantly Muslim countries. You are more generous than I, Kerry. I am concerned about our officials apparently stopping Saudi women from seeking asylum. I am very concerned that the Minister will not comment- seems that responsibility has shifted to a more junior Minister. This article is linked from the one I posted. The Tim Wilson debacle is emblematic of this Government. Little substance, terrible execution and most importantly no idea where boundaries should be. I thought it was bazaar in the first place for there be a parliamentary, tax payer funded enquiry into an Opposition policy. But we now see the Libs are using it to drum up "donations" to talk to the Committee and hand out party membership forms and a company giving evidence (which has family and business links to the Chair ie Tim Wilson, appears to be drumming up business of their own and may have been provided with confidential voter details. This is actually a big deal now because this Government has no idea of what is appropriate. More on the imputation stuff. The graph which shows 72% of household with wealth of over $1.974 M hold 72% of shares says it all. Libs can say what they want- game over. well... this article is certainly more disturbing that the first. It appears that the Saudis have managed to infiltrate and keep tabs on Saudi women asylum seekers and even coerce immigration for direct deportation. The ABC program was talking to Saudi women who had got into Australia and knew women who had failed recently. Here is an artilce that explains the dividend imputation stuff pretty well, for those who are interested. A piece that provides a little more information on the past of our largely unknown PM. Just before Morrison and Dutton disappear in an explosion of exaggeration and misinformation, some hard numbers. Why would people now switch away from coming by plane, in favour of the more dangerous and expensive route by boat? Particularly, now during the monsoon. If, our borders were open under Labor as Dutton and Morrison stated this morning, what are they now? 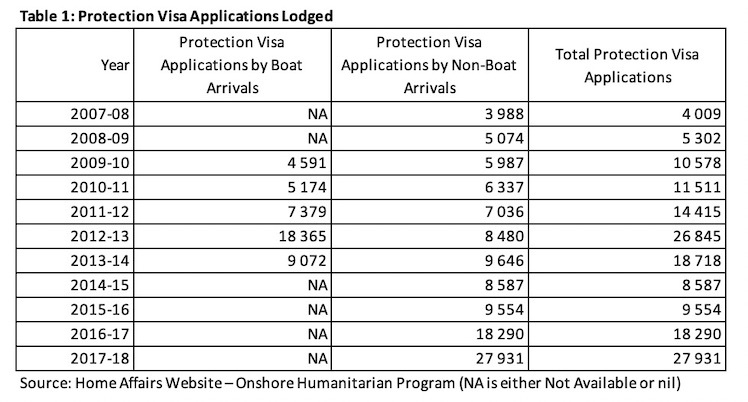 The number of protection visas issued was higher last year than in any year under Rudd or Gillard. I have always suspected that the very high numbers in the last year of Labor were at least, in part, due to an increased sense of urgency drummed up by people smugglers using the rhetoric Abbott was running ie to get here before he became PM and "stopped the boats"..
Labor actually needs to call out the lies being told by a desperate, dishonest government. I applauded Tony Burke yesterday in Parliament for reminding those opposite of their cynical scuttling of the Malaysia solution. Senator Cash arriving at Court. ^ Following on from this. Perhaps the hardest to believe statement from a government Minister in a week where truth was the last consideration. This is depressing. Do they have anything other than shouting at us to be afraid. Seriously, how could anyone vote for a Party so crippled on the biggest issue we have, that they withdraw their own ridiculously inadequate legislation for their 10th best option because they can't control their own minority numbers?